The newly released Jurassic World film has people young and old going crazy for the classic tale of dinosaur mayhem. Hilarious zookeepers and zoologists from all over the world are recreating the “raptor taming” scene with slightly less fierce creatures than dinosaurs. Chris Pratt who plays Owen Grady, a velociraptor tamer capable of controlling dinosaurs similar to a lion tamer, acts out the scene these comedic animal experts are imitating. It all started when Tumblr user feminerds posted a screen shot of the movie scene along with a photo of a zookeeper reenacting the same pose with three well-behaved walruses. This is all it took to send animal workers into a Jurassic frenzy. 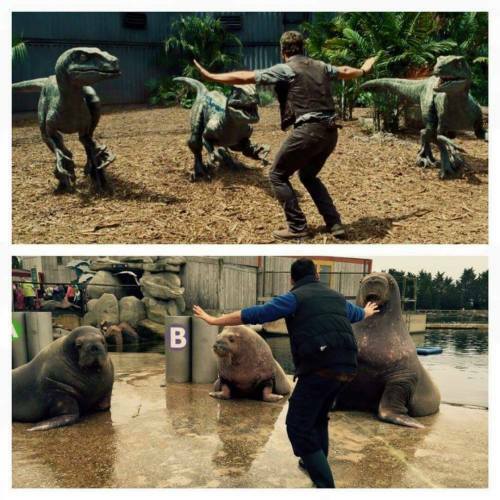 Many have since worked to recreate Jurassic World scene posting under the hashtags #JurassicZoo, #PrattKeeping, and #ZoorassicWorld. Next Up: Doug The Pug Recreates Kim Kardashian’s Sexiest Selfies And The Internet Can’t Tell Who’s Who… Can You?